← Trying to solve the latest Starchild Skull enigma – Where does it belong? 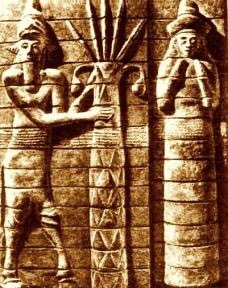 Several texts say Ninlil (“wife of Enlil”) was of divine origin, However, according to the Sumerian text titled Enlil and Sud, Enlil’s wife was a human woman named Sud. Enlil was taken by her beauty (sounds like Genesis 6) and pursued her. To her credit, she played hard to get and didn’t just rollover for the “god.” Eventually, Enlil persuaded Sud and her family of his intentions and they were married. Soon after, Ninlil gave birth to their first child, Nanna, the Moon god. She was known as the “Lady of the wind” particularly the south wind. Some scholars have associated her with the Lilith tales in Hebrew mythology. This entry was posted in Ancient Aliens, Ancient Gods, Anunnaki, Uncategorized and tagged Enlil, Ninlil, Sud, Sumeriam myths. Bookmark the permalink.